Vancouver Island is a long, narrow mountain range adjacent to the British Columbia coast, 300 miles long and 75 miles at its widest part. It is completely mountainous with the exception of a very narrow coastal plain on the east side which provides the only fertile area for cultivation. Because of the influence of the Pacific Ocean, the climate is generally mild and moist - ideal rhododendron country. In May of 1983 the Vancouver Chapter of the American Rhododendron Society chose Vancouver Island for its annual field trip to see the gardens in Victoria at the southern end and to cross over to Pacific Rim Park on the west side to see gardens at Ucluelet* and Tofino. 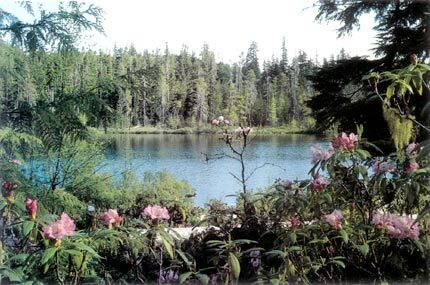 On the return trip, Clive Justice had arranged for the party to take a 4-wheel drive up a logging road to see a pink striped R. macrophyllum growing in its native habitat at Rhododendron Lake. 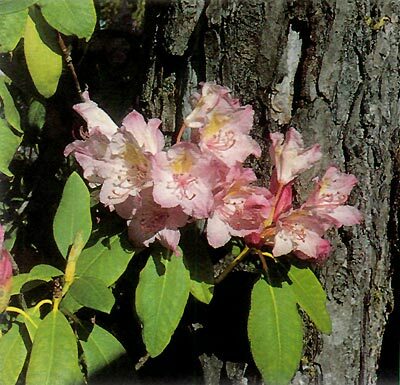 Few rhododendron enthusiasts were aware that R. macrophyllum grew in places other than the Hope Princeton Highway and the Skagit Valley in British Columbia, and of course Washington and Oregon States in the U.S.A. As a matter of fact there are two sites on Vancouver Island - one at Nanaimo Lake and the other at Rhododendron Lake, several miles apart. Because the island is so mountainous, logging is one of its prime industries. Rhododendron Lake is located in a logged-over area. Fortunately MacMillan Bloedel, the logging firm in charge of the area, endeavored to preserve the lake and its pretty pink flowers, totally unaware that anybody was interested. They had made some effort to label the site but the information was very outdated and the Vancouver Chapter, with the probable help of the Victoria and North Island Chapters, saw a wonderful opportunity to upgrade the information and do whatever they could to make the site more interesting; ever mindful that costs might be prohibitive. However the enthusiasm of Harold Johnson and Clive Justice was catching and MacMillan Bloedel responded with equal enthusiasm. At their own expense the logging company graded the very rough 9 mile logging road, improved the lake and its shores and even stocked it with rainbow trout. 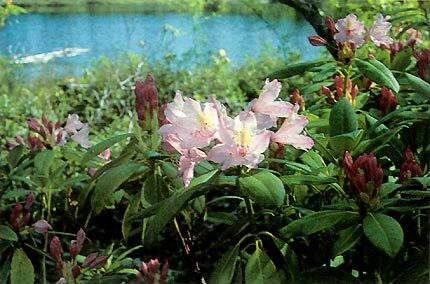 Rhododendron Lake is more than an ecological reserve for R. macrophyllum . Botanically it is extremely interesting. 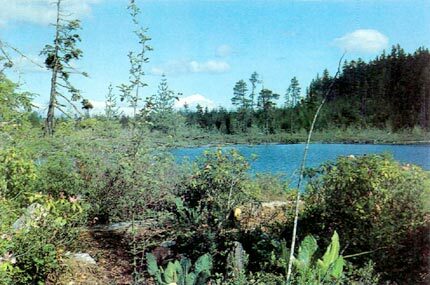 The common habitat of this species is gravelly and open shaded, as in the Skagit Valley, but both this and the bog habitat are present at Rhododendron Lake. In fact yellow skunk cabbage ( Lysichitum americanum ) and the rhododendron grow together. Those at the lake's edge are rooted and growing in the sphagnum bog, making the habitat and plant association unique. Fortunately the rhododendron's fibrous root structure enables it to grow in the sphagnum moss above the water level. Furthermore the water level is controlled effectively by a beaver dam at the west end of the lake. Not all of these rhododendrons grow at the water's edge - a few have moved out of the bog area and have established themselves on the hillside, but the majority are at the edge of the lake. They are growing on the south side only and cannot be found anywhere else, perhaps because this area is sheltered by the surrounding hills. When I returned in mid-June of this year to photograph the plants in bloom I was amazed at the improvement. The logging road is still a logging road but we drove our new Chevy up the 9 miles without any damage, though care had to be taken. I was exceptionally pleased with the labeling. 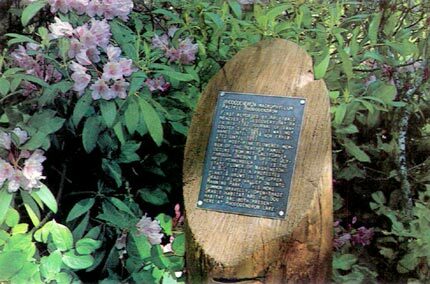 Clive Justice, after weeks of research provided the information; Van Dusen Botanical Display Garden and its Curator, Roy Forster provided the expertise and labour to have a duplicate set of labels engraved with a black background and white lettering. MacMillan Bloedel financed the rest. Yellow cedar logs, approximately 12" in diameter have been harvested on the site, the tops cut at an angle of about 45° with the engraved labels placed at a reasonable readable level, while the bottoms have been driven more than 6' into the ground. Of the many plants associated with R. macrophyllum in this area, I found the yellow skunk cabbage to be the most interesting and I would never expect to find this swamp plant growing side by side with a rhododendron. Among the coniferous trees found in the reserve are Douglas Fir ( Pseudotsuga menziesii ). This is the prime timber species in the lower coastal region of British Columbia. Western Hemlock ( Tsuga heterophylla ) is also found in the bog but is dwarfed and not typical. Yellow Cedar ( Chaemacyoparis nootkatensis ) is the least common of the conifers found in this area and is distinguished from Western Red Cedar ( Thuya plicata ) by its highly aromatic yellow wood, weeping habit, and round cones. The wood of Western Red Cedar has been used for centuries by the Indians, providing their canoes, houses, totem poles as well as bark for clothing and roots for baskets. The Western White Pine ( Pinus monticola ) also grows here but unfortunately a virus known as the White Pine Blister Rust has sentenced it to extinction. At the edge of the lake, growing on the moss, is a pretty shrub known as Sweet Gale ( Myrica gale ) and beside it the Deer Fern ( Blechnum spicant ) with its shiny black stem. Also growing beside the rhododendron is Bog Kalmia ( Kalmia polifolio v. polifolia ) and the Labrador Tea ( Ledum groenlandicum ) both partially in bloom in mid-June. Away from the water's edge and further up the hillside is the Salal ( Gaultheria shallon ) the bunchberry ( Cornus unalaskensis ) and the Oregon Grape ( Mahonia nervosa ), all beautiful plants in their own right but probably more appreciated in foreign botanical gardens. Red Alder ( Alnus rubra ) is the prime deciduous tree in the reserve. R. macrophyllum was not given a name until forty-two years after it was first reported by Archibald Menzies at Discovery Bay, Washington, and was not exhibited until 1885. It is fitting that a century later several concerned people should be instrumental in preserving this site. While this is an ecological reserve, it is still under the management of the logging company, MacMillan Bloedel North West Bay Division, and is only open between 6 a.m. and 6 p.m. after which the road is closed for the night. Visitors should register at the office on the Island Highway, just south of Parksville. A red painted logging arch is at the entrance. On the two occasions that I have been there I have seen bears and evidence of bears. Hopefully this will continue to be a wilderness, accessible, to be enjoyed, and left in its natural beauty. * Ucluelet was the home of George Fraser at the turn of the century. He hybridized 'Albert Close' a cross between R. maximum of the East Coast, and R. macrophyllum of the West Coast. This plant was introduced by Joe Gable and is still in cultivation. Lillian Hodgson is a writer for many publications and Editor of the Vancouver Chapter Newsletter as well as a frequent lecturer on rhododendron photography.